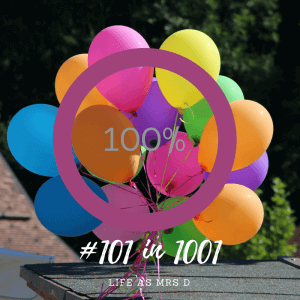 This is a goal that I’d put on my original #101in1001, but never got around to doing. I’ve had a fair few manicures over the years, but just never quite managed a pedicure. I’m one of those people who can somehow manage to smudge my nail varnish 2 days after putting it on. These days I rarely have the time to do it, there’s usually something else more important that needs doing. And so it just rarely happens, usually once or twice a year when my darling Mummy offers to do it! But now, I have managed to tick it off my list. Chris took me away for my birthday to a spa hotel, and some afternoon tea. And my wonderful Mother-in-Law got me a pedicure while we were at the spa hotel. Already managed to chip the nail varnish by the time I took a photo! I was clever enough to remember to take my flip-flops with me so as to avoid smudging as much as possible! I chose a dark red colour, although it turned out a lot darker than the colour on the chart and in the bottle suggested. It was still really nice though. The whole pedicure was really relaxing, although I do hate the small talk you have to make when getting anything like that done. I’m one of those that just likes to lie back and relax. Am I just miserable? Maybe! Either way, I really enjoyed it, and would love to get a pedicure done again sometime soon. I just need to find the time….and the spare money! If anyone has either of those to spare, please send them my way!